A well-preserved fossil crab has been found ‘within inches’ of a tailbone from a ‘massive plant-eating dinosaur.’ This is the first-ever scientific report of a crab fossil alongside a dinosaur fossil, although such has been informally mentioned. In this find at Egypt’s Bahariya Oasis, the same rock deposits enclosing the dinosaur and crab fossils also contained fish, sharks and plants. The researchers imagine, therefore, that these species lived in the same ecosystem—a coastal mangrove habitat dominated by tree ferns. Washington University in St. Louis, <news-info.wustl.edu/tips/2003/science-tech/smith.html>, 14 March 2003. While it is possible that crabs and dinosaurs may have both lived in ‘mangrove habitat,’ this and other fossil evidence actually fits better with the biblical account of the global Flood. Drowned animals (including dinosaurs), uprooted tree ferns and other plant material could have been carried long distances by the Floodwaters before being rapidly buried under layers of sediment along with marine creatures. ‘Fossils found together’ means they were buried together, not necessarily that they lived (or even died) alongside each other—e.g. whale and possum-like marsupial fossils have been found together in Tasmania, Australia (Creation 7(3):6–10, 1985; see also TJ 14(1):110–116, 2000). Brazil has one of the most ‘racially mixed’ populations in the world, including people of European, African and Indian descent. But a gene study has now found that physical appearance—skin colour and facial characteristics—is not a reliable indicator of geographical ancestry. The researchers compared Brazilians classed as ‘white,’ ‘black,’ or ‘intermediate’ and found that their DNA was ‘tremendously overlapping.’ E.g. for ‘white’ people, on average, 33% of their genes were of Amerindian ancestry and 28% African. New Scientist, 4 January 2003, p. 20. ABC NewsOnline, <www.abc.net.au news/scitech/2002/12/item2002121 8135658_1.htm>, 23 January 2003. ‘And He has made from one blood every nation of men to dwell on all the face of the earth, …’ (Acts 17:26). Silicon chip technology is almost at its limit of miniaturization. So computer engineers have been looking to the superior information processing and storage capacity of DNA (the molecule which carries the complete genetic blueprint of life) to boost computer power. It has been estimated that just one gram of dried DNA can hold as much information as a trillion CDs. Now Israeli researchers, following their earlier success in designing a ‘DNA computer’ (New ‘DNA computer’, Creation 24(2):7), have announced a design for an extraordinarily tiny biochemical computer, not just made of DNA, but also fueled by it. With no need of an external energy source, these DNA computers could have medical applications, e.g. doctors could place them inside the human body to identify malfunctions. Each one is so small that a tiny droplet could hold up to three trillion of these DNA computers, in total performing 66 billion operations per second. ABC News in Science, <abc.net.au/science/news/stories/s792007.htm>, 28 February 2003. Proc. Natl. Acad. Sci. USA, 4 March 2003, pp. 2191–2196. Techniques for making diamonds artificially in just a few months by subjecting carbon to heat and pressure are already used commercially (see, e.g., Grisly gems, Creation 25(1):9, 2002). Now researchers can transform graphite into ‘ultrahard’ pure diamond in only a few minutes under static high pressure and temperatures of 2,300–2,500°C. With their extreme hardness (being polycrystalline, they are even harder than single-crystal diamonds), these transparent artificial diamonds could be used in industry where real diamonds are currently used to cut and polish other hard materials. 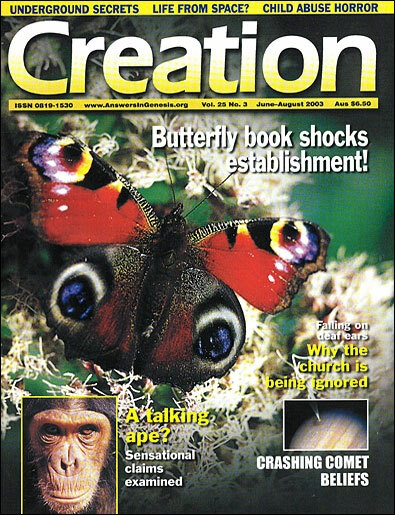 Nature, 6 February 2003, pp. 599–600. Given the extreme heat and pressure deep within the earth, natural diamonds did not need millions of years to form, in direct contrast to common evolutionary ideas about diamond formation. A paleontologist and an astrophysicist have warned that all life on earth will have died out 500 million years from now. ‘The last life may look much like the first life—a single-celled bacterium, survivor, and descendant of all that came before,’ they said. ABC NewsOnline, <www.abc.net.au/news/2003/01/item20030 115123853_1.htm>, 15 January 2003. Space.com, <space.com/scienceastronomy/big_rip_030306.html>, 11 March 2003. Such bleak evolutionary story-telling (and its consequent effects on society) can only be countered by proclaiming the true biblical account of Creation—with its attendant message of hope. The Sunday Mail (Brisbane), 16 February 2003, p. 31. The search for extraterrestrial intelligence (SETI) is expanding. SETI astronomers are planning to link an array of hundreds of dishes (as used for satellite TV receivers) into one huge telescope and scan the skies for alien signals 24 hours per day. New Scientist, 8 February 2003, p. 12. Thousands of young trees in pots are expected to be ready for release in 2005/2006, and authorities are inviting anyone wanting to grow their own ‘dinosaur tree’ to register as prospective buyers. With the Wollemi Pine website providing details of the release under slogans such as: ‘Waiting 200 million years to be in your garden,’ international demand is expected to be high. The Sunday Mail (Brisbane), 16 March 2003, p. 43. Wollemi Pine, <www.wollemipine.com/>, 18 March 2003. The Wollemi Pine arouses excitement because it defied evolutionists’ interpretations from the fossil record that the tree had been extinct for millions of years. Note, however, that there has been no evolutionary change. And in the light of the global Flood just thousands of years ago (not millions), it is hardly surprising that many species previously known only from fossils turn out to be still living. Teachers in Denmark’s primary schools have been warned not to overly criticize Darwin’s theory of evolution when teaching biology. The warning is from the chair of the Danish Teachers’ Association, Anders Bondo Christensen. It follows an appeal from the Christian People’s Party for Danish teachers to ‘soften up’ on their teaching of evolution in public schools, allowing for a more roundly critical view of evolutionary theory. The Copenhagen Post, <cphpost.periskop.dk/default.asp?id=25516>, 3 March 2003. Researchers have found two ‘ancient’ biological molecules—mitochondrial DNA and the bone protein osteocalcin—in a bison fossil (from Siberian permafrost) dated at over 55,000 years old. It’s the first time both DNA and protein have been recovered from such an ‘old’ fossil. The exceptional preservation of osteocalcin has raised hopes that proteins can survive intact for much longer than previously thought. One of the researchers estimates that osteocalcin might survive for more than 100 million years at 0°C, and for 10 million years at 10°C. So, by looking at the changes in proteins over geological time, the researchers hope to find the answers to ‘long-standing evolutionary puzzles.’ In this study the osteocalcin protein of ancient and modern bison matched exactly—unchanged over 55,000 years. Geology, December 2002, pp. 1099–1102. GSA News Release 14 November 2002, <www.geosociety.org/news/pr/02-54.htm>, 28 January 2003. NewScientist.com, <www.newscientist.com/news/news.jsp?id=ns99993058>, 31 January 2003. Evolutionists have been skeptical about reports that dinosaur bones, dated at over 65 million years old, contained osteocalcin and even red blood cells (Creation 15(2):9, 1993; Sensational dinosaur blood report!, 19(4):42-43, 1997; see also Salty saga, Creation 23(4):15, 2001.). They surmised (logically) that organic material should have long since biodegraded—but they missed the obvious conclusion that the bones must be ‘young’ (consistent with being buried in the global Flood around 4,500 years ago). In the United Arab Emirates, camels and llamas are being crossed to produce ‘camas,’ in an effort to breed animals with the sought-after coat of the llama and the endurance of the larger camel. Rama, a male, was born in 1998 [see Rama the cama—for creationists, no drama, Creation 20(3):7] and now Kamilah (picture available in Creation magazine), a female, has arrived, the researchers are hoping she will attain a size somewhere between her 85-kg llama mother and her 500-kg camel father. The first hybrid, Rama, has a llama-like spirited disposition, but he sounds and looks more like a camel. The Evening Post (NZ),23 March 2002, p. 11. Camels and llamas are classified as camelids (along with the South American alpacas) and their ability to hybridize indicates descent from the same created kind. Noah thus only needed a pair, male and female, of this kind aboard the Ark, rather than two llamas, two camels, etc. See also Ligers and wholphins? What next?, Creation 22(3):28–33.